Notes: 1. Publicity generated in early 1916 concerning this film indicated it would be released as part of the Mutual Program as a Mutual Masterpicture, DeLuxe Edition. The film was scheduled for release on June 29, 1916, and some schedules carried this date. The picture was postponed to August 27, 1916, then to September 10, 1916, then to November 1916. 2. The film story is set in South Africa. Outdoor filming began in mid February 1916 and was done near East Mayport, Florida and Jacksonville. Featured were five white people in prominent roles and approximately 500 blacks, who served as extras. The settings comprised three separate African-style villages, a temple, and a trading station. The film was said to have been the most expensive picture produced in Florida up to that time. 3. An article in The Moving Picture World August 5, 1916, said that Hidden Valley would be the second Thanhouser Gold Rooster Play to be released through the Pathé Exchange. This did not come to pass, and the film was rescheduled, as noted. "William McNulty, the scenic expert and stage manager of the Thanhouser Company, is building a typical African village at the beach. It will be used by Ernest Warde in producing The Hidden Valley, which the Thanhouser Company will release at an early date." "Mlle. Valkyrien, formerly the star of The Royal Danish Ballet and the Great Northern Film Company, has just finished work in Hidden Valley, a five-reel feature, an African drama, for the Thanhouser Company. In the picture, which was photographed in Jacksonville, Florida, Mlle. Valkyrien portrays the leading role, that of the only white woman in the story. Chief in her support is Boyd Marshall. The majority of the African scenes were taken in the palmetto jungles near East Mayport, Florida. Edwin Thanhouser, who dropped in to Jacksonville just as the picture was nearing completion, declared his belief after seeing the film on the screen that Hidden Valley will be a famous picture. During his visit to the South it is said Mr. Thanhouser offered Mlle. Valkyrien a two-year contract, and according to word from Jacksonville, it is more than likely the return of the player to New Rochelle in May will be followed by an acceptance. Mlle. Valkyrien is already at work on another five-part feature for the Mutual Program, The Image Maker of Thebes, in which her great talent for classic portrayal will have full play. The subject opens 2000 years B.C. and finishes on the piazza of a Florida hotel. 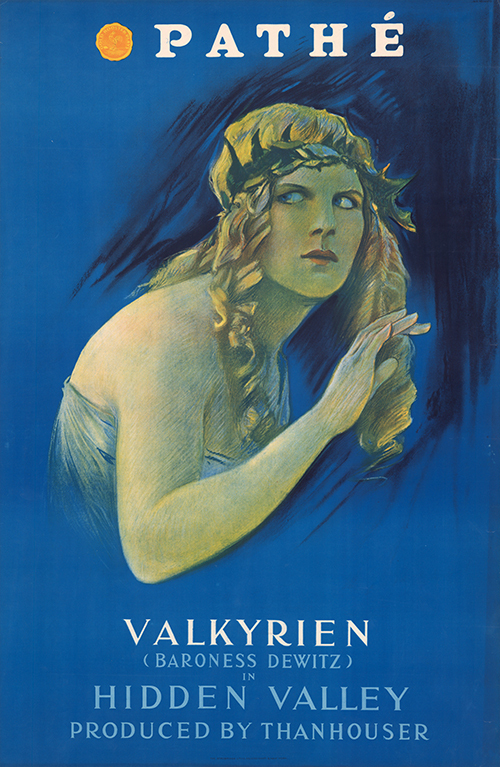 The stage name of the player is taken from the title given her by the King of Denmark - 'Valkyrien, Year of 1914' - as a result of her selection from representatives of every community as a woman best typifying the beauty and racial characteristics of the legendary Danes." "In Hidden Valley, Valkyrien is a white goddess who has been captured by savage blacks in South Africa. She is found by a young missionary, played by Boyd Marshall, and rescued from a sacrificial altar. Valkyrien was selected as the most perfectly formed girl in Denmark in a competition conducted by the government. The dance of the white goddess before the natives is one of the most beautiful scenes in the production. The story is by Emmet Mixx, the director was Frederick Warde. The picture was made in Jacksonville, Florida; the date of the release is August 27." "A different sort of a drama, the beautiful and absorbing scenes laid in South Africa, is Hidden Valley, starring Valkyrien (Baroness DeWitz), which will be released by Thanhouser through Pathé in November. Valkyrien, the beautiful Danish dancer, plays the part of the 'white goddess' of a wild tribe of ostrich hunters. The 'goddess,' an American girl, has been captured by the natives, who are about to sacrifice her to their water god, when aid arrives in the person of a young New Yorker, played by Boyd Marshall. The feature was directed by Ernest Warde, and the South African scenes, notable for artistic photography, were made in Florida. Mr. Warde himself plays the part of the high priest of the savage tribe. The play gives Valkyrien splendid opportunities. The sacrificial dance of the white goddess is particularly well done." "Hidden Valley, a South African drama, was made by Ernest Warde from a story by Emmett Mixx. Valkyrien appears as an explorer's daughter who is captured by savages and is hailed as their white goddess. The tribe is on the point of sacrificing her to the god of water when a young divinity student, played by Boyd Marshall, appears and by adroit tactics rescues her. Ernest Warde, the director, himself plays the part of the villainous high priest of the African tribe. Arthur Bauer is the feather importer who sends the young man to Africa." "When the South African river scenes for Hidden Valley were being made in Florida, Boyd Marshall rescued Valkyrien from drowning. Valkyrien's skiff was supposed to turn over and she was to be drawn underground by the river. Valkyrien, worn out by exposure, collapsed as she was swimming ashore after the capsizing scene. Mr. Marshall, who was standing near, dived in and dragged her out. The rescue was filmed, but it was wasted, for Mr. Marshall, according to the play, was not supposed to see Valkyrien until a couple of years later." "A young student, finding his sweetheart no longer loves him, accepts an assignment to go to the wilds of Africa and learn the cause of the shortage of ostrich plumes. Arrived, he finds that death awaits the intruder, but undaunted he goes forth just as the natives are praying for water. He kills a vicious native who is about to attack the priest's son, and the other natives hail him as their god. He learns that a white girl is to be their sacrifice, but he endeavors to save her. He is informed that unless water comes they will both be burned. With the assistance of blasting the desired water flows forth freely and all ends well." "Most of the action of Hidden Valley takes place in a remote district of Africa, and, thanks to a careful director, this difficult location has been convincingly transferred to the screen. With due gratitude to California as the natural habitat of the motion picture, the Florida landscapes in this Thanhouser release besides being ideal backgrounds for the fantastic story are refreshingly unfamiliar. Boyd Marshall and Valkyrien enact the leading parts. Mr. Marshall is seen in the role of a young missionary, who goes to Hidden Valley, the habitation of a savage tribe. Here he finds a young white girl who has wandered to the valley and who is doomed to be sacrificed to the tribal gods. The missionary is hailed as a deity and to save his own life he is obliged to pose as a supernatural being. The natives, of course, demand proof of his divinity and ask him to cause the waters again to flow through the valley. By means of a little Yankee ingenuity and gunpowder, he performs the 'miracle' and saves the girl and himself. Incidentally, on the strength of his apparently superhuman power, he converts the savages to Christianity. Much of the interest of the story of this sort depends on its manner of presentation, and Hidden Valley offers much. The scenes of life in the savage tribe are as real as those found in Africa, and every possibility for picturesque effects has been seized upon by the director. Valkyrien, who seems doomed never to play just a plain everyday straight role, is seen as the captive white girl. The plot gives her a legitimate opportunity to dance and to wear flowing white clothes, the kind vaguely called 'Grecian robes.' She is one of the few screen actresses who is successful in exotic roles." "Hidden Valley, while somewhat tritely worked out, contains a certain fantastic charm and melodramatic suspense which place is far above most of the feature pictures shown in recent weeks. A young divinity student is its hero. Through unrequited love, wounded pride and possibly an outgrowth of his environment, he seeks new fields in which to spread the Gospel. In this case he renounces civilization and unlocks new doors of spirituality in the primitive but plastic minds of the dwellers in the far off Congo-land. After being disavowed by his fiancée, his uncle, an extensive importer of ostrich feathers, engages him as manager in a remote African station to investigate the apparent shortage in the feather market. Here, he discovers from the natives that an abundant supply can be gained in 'Hidden Valley,' a forbidden land, sacred to its inhabitants, whose lives seem to be wholly devoted to the pursuit of fantastic religious rites. Undaunted by these revelations, and beset by various vicissitudes, he is accompanied by a retinue of assistants. Fearful of the consequences that spell death, all desert him but one faithful black. He enters the boundary of 'Hidden Valley,' disposing of a treacherous native who attempts the life of the high priest's son at a festival. Here he discovers a captive white girl placed in this dangerous situation by her father's ill-fated expedition, where she was swept along by a subterranean river to a cavern beneath the temple - a secret passageway unknown to the natives. They are both to be sacrificed unless he can assert his deity by freeing the 'Valley' from its aridity. He achieves this exalted state by blowing the temple to fragments, allowing the pent-up water to rush forth in Niagaran abundance. The settings are in complete accord with the locale, and the conformity of action with the tone of the photography develop an atmosphere that suits the situation. Valkyrien as the captive white girl, in a light, diaphanous costume is pleasing, and she possesses a certain magnetic force which is used to good effect. Boyd Marshall acted the young theologian with power and repose. The balance of the cast played their parts admirably." "Valkyrien is the featured player of Hidden Valley, a five-reel Pathé Gold Rooster screen drama made by the Thanhouser Company. The important scenes take place in South Africa and suggests the tales of adventure of which Rider Haggard has been so prolific an author. Hidden Valley has the necessary ingredients to make such a story palatable. There are savage tribes, a manly hero, a captive white girl and a mysterious temple that is her prison house. A young divinity student, who is 'given the mitten' by his sweetheart, accepts an offer from his uncle to go to Africa and investigate a business matter. The uncle is an importer of ostrich plumes and wants to know why his supply has fallen off. In the remote station to which he is sent the young man hears of a hidden valley where plenty of feathers are to be found, but where the natives are anything but friendly. In spite of warnings he enters the valley and meets with several surprises. The natives take him for a god and insist that he restore the valley to its old fertility by bringing water again to their lands. The student succeeds in doing this, with the help of a beautiful white girl who has been captured by the tribe. It is their intention to offer her as a sacrifice, so she dresses becomingly in white robes and is attended by a score of dusky maidens who teach her their native dances. "The arrival of the divinity student opens the way for her escape. She is able to show him a stream of water that flows under the temple, and the tribe is tricked into believing that their new god has called it into existence. The student is allowed to depart with the girl. Ernest C. Warde is responsible for the direction of the play. He shows patience and skill in drilling the cast and the extra people, and has given the African scenes considerable local color. Valkyrien, who is also the Baroness DeWitz, looks fetching as the captive maiden in acts of good effect. Boyd Marshall, Ernest Warde, and Arthur Bauer are the prominent members of the supporting company." "The scene shifts to Africa in the most interesting and exciting parts of this play. Boyd Marshall is disappointed by his fiancée and goes to Africa to forget her. Her uncle imports ostrich feathers, which causes Marshall to go on an adventurous trip into the interior. He saves the life of a chieftain by shooting his unfaithful follower. The natives think he is a god and the chieftain demands that he make the water flow in the valley as it used to in the old times. Then Valkyrien, who is known in private life as Baroness DeWitz, appears on the scene as a captive girl. She does a sacred dance. The white man and the white maiden get an opportunity to confer together. She tells him that they will both die unless they can perform a miracle. Marshall finds from the girl that the river runs under the temple and that there is a secret way to it. He discovers that there is a dam which shuts the river off. With powder, which he gets from his camp outside the valley, Marshall blows up the obstruction and the valley is well irrigated. As a reward the chieftain and his followers regretfully assent to the going of the pair and promise to open their valley to the world and to higher ideals. Valkyrien is the star of the piece and makes a very graceful captive maiden. Her dancing is quite graceful and she does rather well in emotional acting. Marshall makes a manly type of hero. The rest of the cast are good. The story is of rather melodramatic quality, somewhat of the order of Rider Haggard. The direction has achieved as much as is possible with a story of this type. Photography is average. - C.M." REVIEW, Variety, October 27, 1916: This review is reprinted in the narrative section of the present work. REVIEW, Wid's Film and Film Folk, October 26, 1916: This review is reprinted in the narrative section of the present work.